We are excited to announce the general availability of Azure SQL Data Warehouse in three additional regions— Japan West, Australia East, and India West. These additional locations bring the product worldwide availability count to all 33 regions – more than any other major cloud data warehouse provider. With general availability, you can now provision SQL Data Warehouse across 33 regions with financially backed SLA of 99.9 per cent availability. SQL Data Warehouse is a high-performance, secure, and compliant SQL analytics platform offering you a SQL-based view across data and a fast, fully managed, petabyte-scale cloud solution. It is elastic, enabling you to provision in minutes and scale up to 60 times larger in seconds. It comes standard with Geo-Backups, which enable geo-resiliency of your data and allows your data warehouse to be restored to any region in Azure in the case of a region-wide failure. 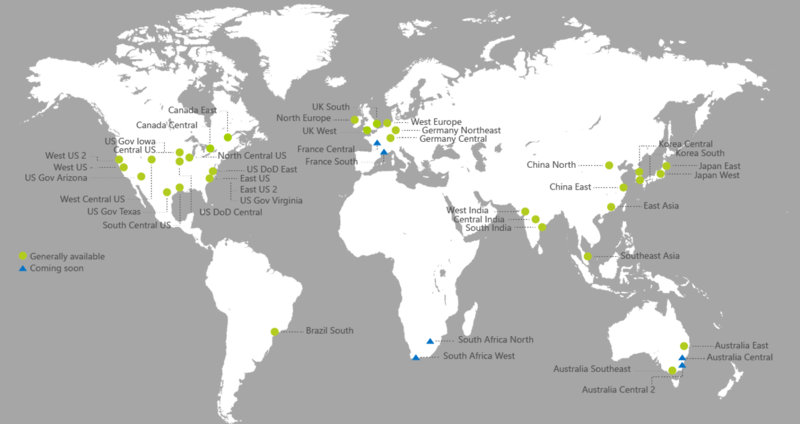 Azure regions provide multiple, physically separated and isolated availability zones connected through low latency, high throughput, and highly redundant networking. Starting today, customers can leverage these advanced features across 33 regions. Begin today and experience the speed, scale, elasticity, security, and ease of use of a cloud-based data warehouse for yourself. You can see this blog post for more info on the capabilities and features of SQL Data Warehouse. We would love to hear from you about what features you would like us to add. Please let us know on our feedback site what features you want most. Users who suggest or vote for feedback will receive periodic updates on their request and will be the first to know when the feature is released. In addition, you can connect with us if you have any product questions via StackOverflow, or via our MSDN forum.